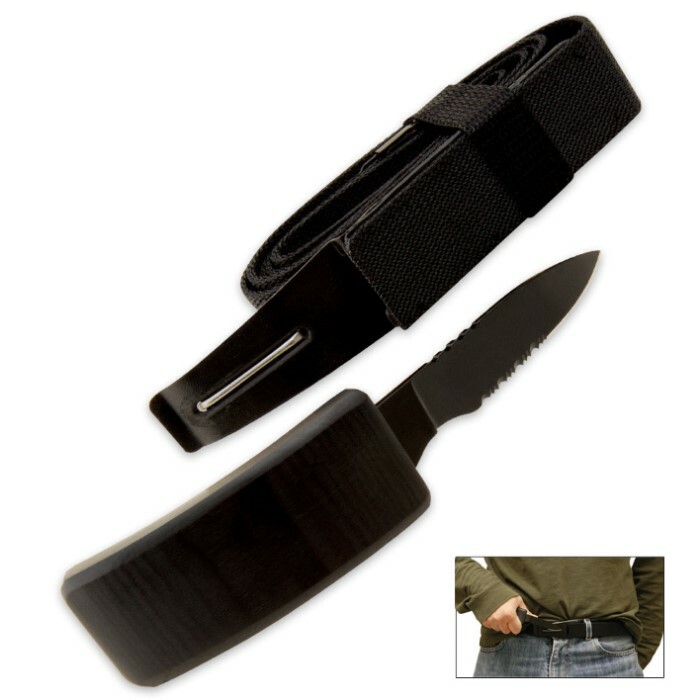 Tactical "hidden in plain sight" belt knife system! 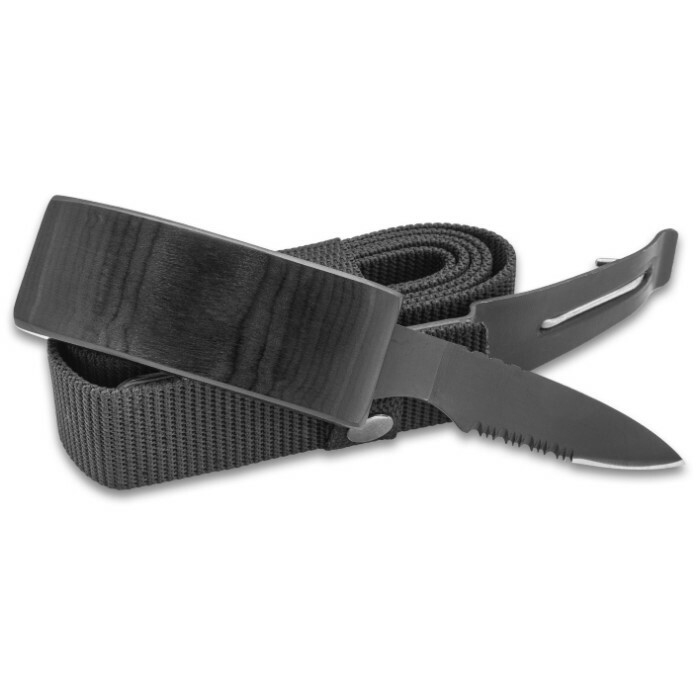 Feature a fast access 440 Stainless Steel combo blade full tang knife, this belt gives you the upper hand in self defense situations. Fully adjustable 53 in. belt. One size fits most. Simple is better when it's a last ditch option, from the losing position, quickly deployed and it's a game changer. Never see it coming, that's the point. Bravo Bud K! Sharpens easily, convenient. The handle sticks out and is noticeable. I feel like it is not too stealthy and could be spotted easily. I will try the advise below and remove the metal buckle and put holes in the webbing to fasten the knife. Perhaps it will lay flatter. Webbing is very thin. The belt buckle at first stands out rather far. The way this was handled was by removing the adjustable hole, and then punching new holes into the belt itself with a hole puncher. After punching the holes where you want them, simply take a match and burn the hole so they are hard (the same way you do when you cut the tip for sizing it to you). You can now leave it and use it or install some hole caps. Ether way this brings it vary close and lets it look much more like a normal belt. They will last almost two years before the stitching from the holster will start to come away from the belt, after witch it’s just time to get a new one. The full aluminum buckle has been the longest lasting one so far. Hope this helps anyone else and enjoy them cause they are nice to have. This is an excellent product. I have entered numerous concerts, sporting events with my belt...never a problem. Yes, the metal detector goes off...but, its only a belt buckle. 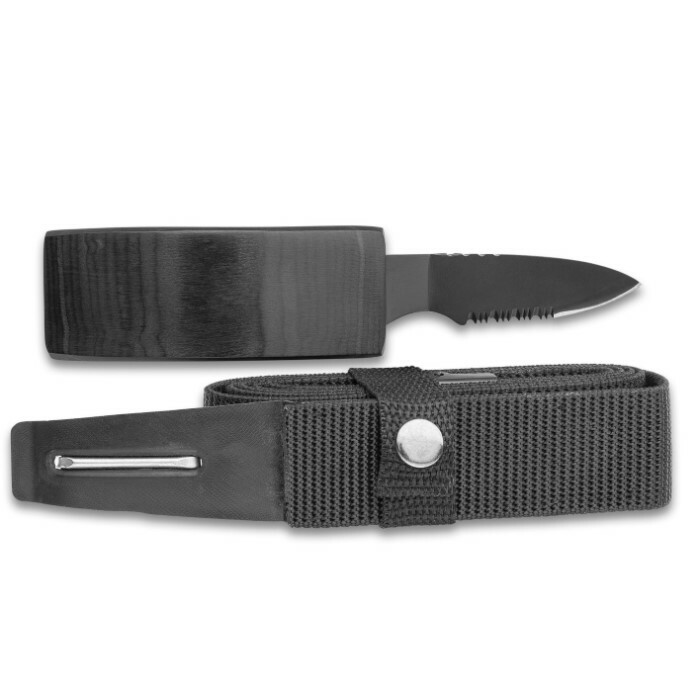 The only issue with this product is that the buckle eventually loosens and comes off the metal portion of the knife. I am in the process of applying epoxy to it...hopefully it adheres stronger than before. Great product ...that needs the buckle to knife connection reinforced. Was really looking forward to getting this belt. However once it's fastened it not flush like a regular belt buckle, one side sticks out making it noticeable. My guess is that it's designed that way. 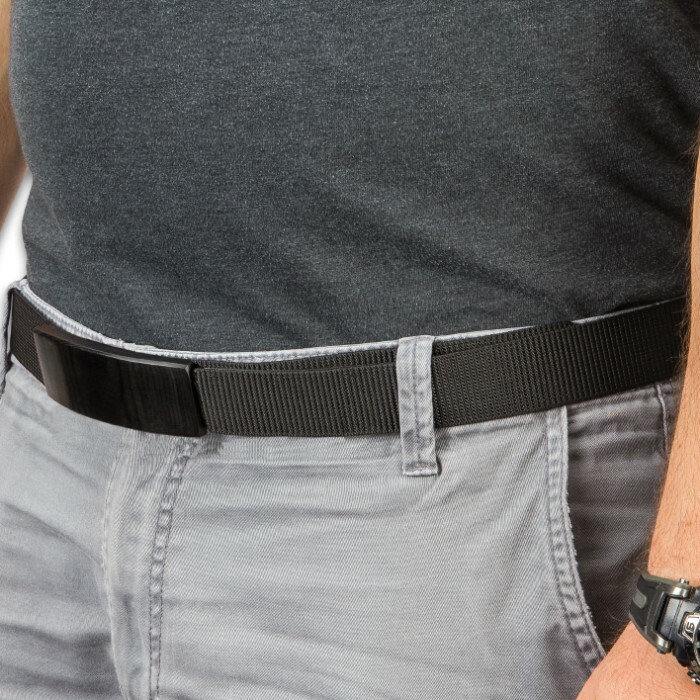 I don't think the average Joe will notice it from far away, but if someone is very close to you and checking you out, it doesn't look like a normal belt. I think it's a great idea and not a bad design, but I think it could be a little better. Response: Hi Leah, We apologize for the "I think it's supposed to be that way" comment. I will attach this review in an email and send it directly to our Customer Service manager to handle this issue. But if you are not satisfied with the product, you may return an item within 60 days of purchase. You can contact us at 1-800-735-3326 to obtain a return label for your package. Thank you for taking the time out of your day to relay this information to us. Thanks! I have had this knife for a couple months now, and i have only had to use this knife once, and the self defense capabilities are somewhat questionable, but 9/10 will get the job done. This is a great belt which lets you feel secure knowing you have protection, i recommend anyone who interacts with various people do own this. 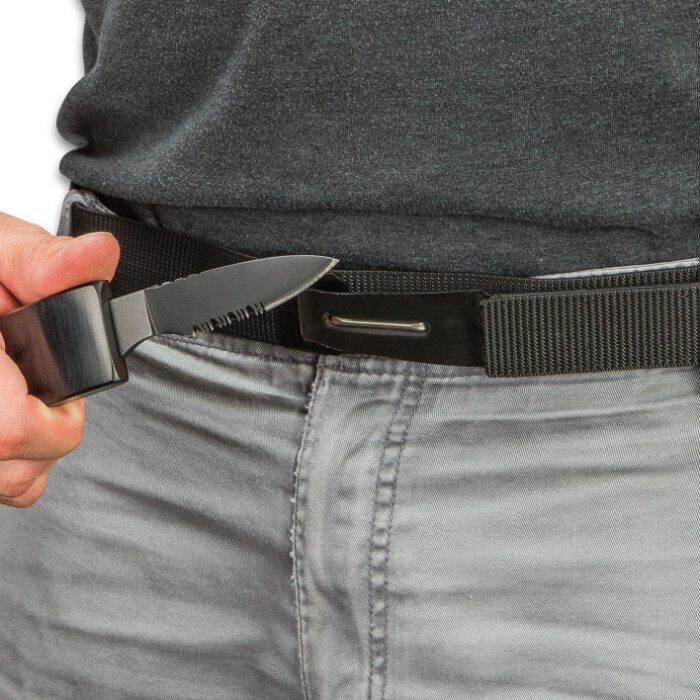 This belt is so concealable that you could probably wear it in most places :P but i don't really recommend you wear it in places you could get into trouble. Very well made and completely stealthy. You will never guess someone has one on them until they tell you. Great product! I have bought two of these, the quality and reliability is excellent for the price. I bought this belt a few years ago and have worn no other belt since. It's durable and holds up well. I just bought another one as a spare. I see the reviews for the newer version are a little iffy, but the one I bought gets a lot of compliments and nobody knows it harbors a knife. As a public servant, facing different kinds of people at all hours of the day and night, it's nice to know I have a little back-up if ever needed. So far, haven't had to go that far, but it's nice to know it's there.